As the 19th Century transitioned to the 20th and Benjamin Beneteau was combatting the smear tactics of competing shipyards, mechanical engineer Rudolf Diesel was perfecting his modification of the internal combustion engine. 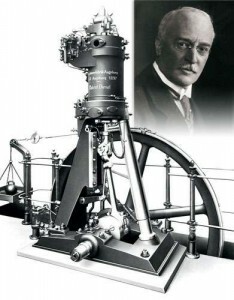 Diesel was aware that over 90% of the fuel used in steam engines was wasted, never converted to mechanical propulsion. Diesel correctly theorized that there would be an incredible demand for an extremely efficient, reliable, internal combustion engine capable of running on commonly available fuels. Rudolph Diesel dreamed that farmers might be able to grow and process their own fuels, and his first engines were fired with peanut oil. When Rudolph Diesel disappeared from a passenger liner in the early 1900’s, conspiracy theorists suggested he came to foul play at the hands of thugs hired by petroleum barons. When we refer to “diesel fuel” today, we normally refer to fuel refined from petroleum. In the early decades of the 20th Century, the diesel engine became popular in commercial fishing boats. Within a half century, nearly all commercial fishing in North America and Europe relied on power vessels, rather than sail. During those same years, steam engines were supplanted by diesel. Ocean going vessels incorporated smaller, more efficient engines. While the range of a sailing boat remained unlimited, (given favorable winds), smaller and medium size power boats could suddenly carry enough fuel to travel thousands of nautical miles. Pleasure boaters interested in long range cruising were slower to adopt a charitable attitude toward power boats. In the early 20th Century, only the most financially elite Americans could ever consider owning a large pleasure boat. “Yachtsmen” cruised long distances on elegant sloops, yawls, and schooners- supported by large, typically uniformed crews. Organizations such as the New York Yacht Club, hidebound to tradition, discouraged power boating, and commonly banned power vessels from their fleets. (Although rapidly diminishing among true, bluewater voyagers it is still possible to encounter remnants of anti-power attitudes among a small percentage of sailors).